Because we never forget, and neither should you. 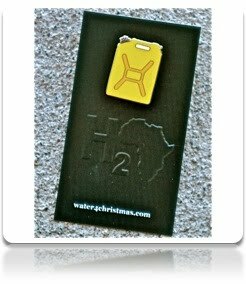 Water for Christmas is all about World Water Day, of course. So here are these pins. They’re a perfect conversation starter. Put them on your backpacks, your purses, jackets, whatever. You can buy them here. Buy them for everyone you know. It’s not an exaggeration to say I have one on every purse, backpack and jacket I own. Hope you will too! They’re listening, so talk about it with everyone you know.